The design of this picture is heavily influenced by calligraphy and rich in diverse manners of graphic expression. 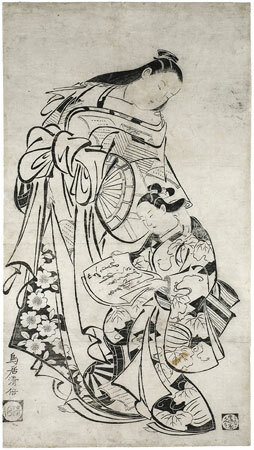 At the centre is the letter that the young kamuro is reading to her mistress; the two female figures are also very richly “described” – through sweeping lines and motifs like wheels, books, cherry blossoms, and pumpkin vines on their kimono. TORII Kiyomasu I (active ca. 1690-1720): Almost nothing is known about Kiyomasu I’s life. Yet compared with Kiyonobu I, his œuvre is more extensive and offers more variety. The high point of his work is represented by the large-format illustrations of courtesans, which enabled him to develop his originality to the greatest extent. The confusion of calligraphic brush strokes, which at first sight seems entirely erratic, is not in fact without order: but the underlying principles are other than those of a system of compositional rules. The ease with which writing and drawing, drawing and writing, flow into each other and allows the imagination to assemble the picture into a whole. Here is a courtesan with her novice. A letter which the novice is reading aloud to her mistress – a thank-you-letter for a message received – can be taken as the pivot of the remaining graphic events. The letter contains calligraphy which is legible – if with some difficulty. The same calligraphic movement within the rectangular page escapes over its borders, loses its sense as writing and proceeds to „describe“ the figuration of the image of the woman, drawing on an apparently inexhaustible stock of wonderfully varied means of graphic expression. Lines, patterns and symbolic images, a head and a hand, a wheel and a book, all these elements are integrated into a work of art which combines brittleness of substance with richness of form, a product of the traditions of an ancient culture confident of its own strengths. When we immerse ourselves into the movements of the handwriting, we come into closer contact with the person and nature of one of the great masters of Japanese woodblock art, Torii Kiyomasu I – nearer than we could possibly expect, considering the very foreignness which is almost beyond our reach. No other impression of this woodblock has survived.